Here at Visible Body, we use technology to help healthcare professionals and students see inside the body, and we aren’t the only ones! Other healthcare professionals are visualizing the body in new ways to help explore fertility, history and education in the industry. Here are three cool visualization innovations that we’ve seen in the news recently! Watch a fertilized egg develop! From cells, to organs, to birth... this new microscope is strong enough to see organs start to develop. Researchers at the Howard Hughes Medical Institute developed a new microscope that traces embryonic cell movement in real time, sketching a virtual map of how organ systems develop. Using a cell-tracking program, they followed each individual cell through a critical 48-hour window — from six-and-a-half to eight-and-a-half days after fertilization — during which the embryo grows to about the length of a sesame seed and its vital organs begin to form. Watch embryonic development in mice here. Researchers use mice to track this embryonic cell movement because human embryos develop in a similar way. By visualizing how organs form in mice, scientists can find new ways to examine developmental issues inside the human womb. Do you know that Neanderthals stood up straighter than modern humans? That’s what the latest research suggests! Neanderthals were hunter-gatherers that lived 400,000 years ago. Scientists at universities in Israel, Spain and the US, including University of Washington, used CT scans of fossils from an approximately 60,000-year-old male skeleton to create a 3D model of a Neanderthal thorax. This is the first 3D virtual reconstruction of a Neanderthal rib cage ever made. This video shows how the Neanderthal’s ribs attach to the spine in an inward direction, giving the male a more upright posture than modern humans. The model has contradicted the “longstanding image of the barrel-chested, hunched-over ‘caveman’” Neanderthals are usually depicted as. It shows that the male may have stood more upright, and had a greater lung capacity than humans. Compare the Neanderthal thorax and spine in the video to ours! Do you see how the Neanderthal spine is straighter than ours? 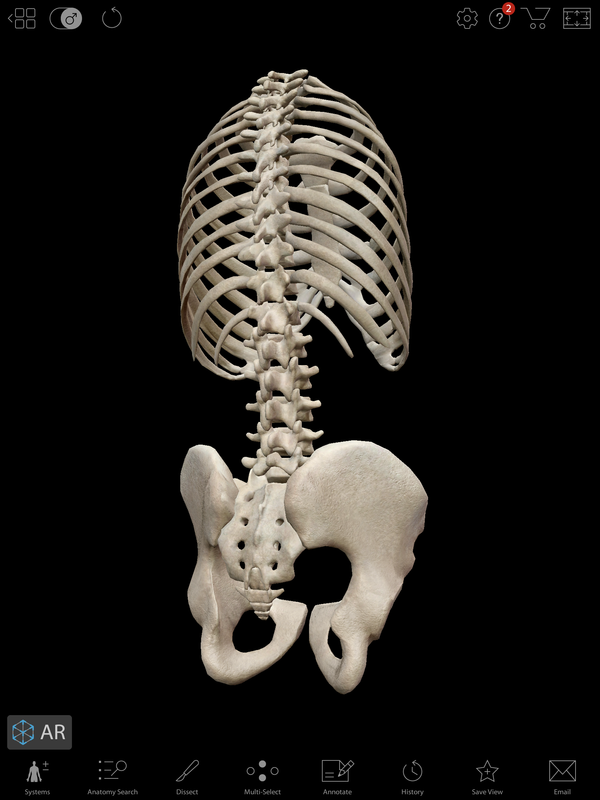 This image from Visible Body's Human Anatomy Atlas shows the curve of the lower spine. Can Artificial Intelligence "read" diagnostic images? Visible Body's in-house medical visualization professionals study medical imaging to build accurate 3D anatomy models... while the team at University of Heidelberg, Germany, is analyzing huge volumes of medical images with artificial intelligence (AI) to diagnose skin cancer. The study used 100,000 skin images with various conditions and compared the analysis of 58 dermatologists to the results of an AI systems. The dermatologists accurately diagnosed 88.9 percent of malignant melanomas and 75.7 percent of lesions that were not cancer. The deep neural network accurately diagnosed 95 percent of malignant melanomas and 82.5 percent of benign moles. In this one study, the computer software that used AI was more accurate! Interested in using virtual 3D anatomy models and animations to teach about the human body? Check out Visible Body Courseware! Sign up to get our awesome emails and be the first to know about free anatomy content, new blog posts and eBooks, secret sales, and more!